Those are the three words my good friend uses to help her kids understand whether they are making good choices with what they say. “Is it kind? Is it true? Is it necessary,” she asks when they may have said something that is rude or unintentionally hurtful. I initially thought her approach was a bit out there, but I decided to see if it would help my young children think about what they say and how they say it. A few months in, I have to admit that this new system has led to a bit of enlightenment in my household. My 8-year-old now can express why she may not have chosen the right words. And she does seem to share fewer unnecessary (ahem: correcting-people) stories. I think about these three words – kind, true, and necessary – not only at home but also in the context of content marketing. What three words describe your content? While your three words aren’t magic beans that will transform your content, they will help your brand to have a consistent voice. They can serve as instant reminders to editors and writers of how your content should be written and how your stories should be told. Want to create content with the perfect tone and style? Ann Handley, Doug Kessler and more share their secrets in this 60-page eBook. Everything you ever wanted to know about capturing the heart of your brand with perfect pitch. Neither approach is better than the other, but each communicates a distinct brand perspective. You get a sense of the airlines simply by observing how different their tones are. While an editorial mission statement is an insanely useful lens on its own, you also should ask yourself if your content – from text to videos to podcasts and everything in between – sounds like your organization’s voice. You should be able to ensure that consistent voice and message more easily. Does this advance the practice of content marketing? Is this for enterprise marketers? Is this written in a way that is authoritative, approachable, informative, relatable, and entertaining? In full disclosure, we are using these next exercises to update our voice guidelines. Keep reading to learn how to do so for your own brand too. There are a few ways you can get to your words. Marcia suggests going through an exercise called, “This, Not That.” In it, you define which adjectives define your tone of voice – and which don’t. We did this exercise when we updated CMI’s blog guidelines last year. (To be honest, we were “inspired” by MailChimp’s style guide). Don’t use adjectives like “cutting edge” because they are meaningless and unhelpful. Don’t borrow anyone else’s voice. Another way to arrive at your three words is to use the approach outlined by Micah Daigle in which he explains how Asana (a project management tool) rebranded itself. 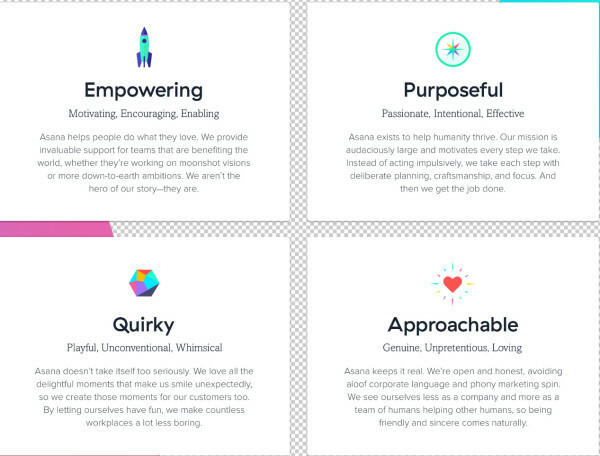 While this article covers many aspects of rebranding, I adore and often refer to the part about how Asana came up with the words it considers to be the guiding star for its brand: empowering, purposeful, quirky, and approachable. OK, that’s four words. The idea is to pick enough words to capture a multifaceted voice but not so many words that no one will remember them. Let’s just say that if you want to help content creators express your organization’s unique voice in a useful way, you probably need at least three words – it’s a good start and it may be all you need. This question was the guiding light, and they asked people in their company to answer it. The team culled the responses – there were thousands – and came up with an initial set of six core attributes that they shared with the entire team (you can see below) and ultimately, with the help of their rebranding agency, pared it to four. Also worth noting is that Asana gave each word a short description so everyone was on the same page with how the word should be interpreted. I also like this exercise from Kevan who suggests using this structure to help everyone in the company get on the same page for each word. While expressing an organization’s voice in three words is not a novel concept, it’s something that can be incredibly powerful as you refine how your brand can sound like you – and like no one else. 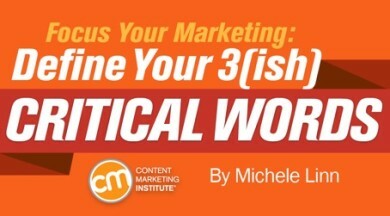 I’d love to hear from you: Are you using three(ish) words as guiding principles for your brand voice? Want to expand your content strategy skills? Register today for the Intelligent Content Conference March 7-9 in Las Vegas.